A female Ichneumon wasp under the bark of a dead sugar maple. 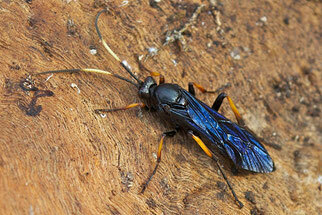 I found this female Ichneumon wasp (Ichneumon centrator) while cutting sugar maple logs for cordwood. The adult females hibernate for the winter beneath loose bark of fallen trees, which is where I found this one. North America is home to about 140 species of Ichneumon wasps. This subfamily of wasp, Ichneumoninae, are parasitic and lay their eggs in mature caterpillars. 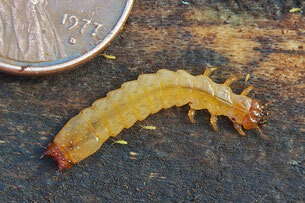 This larva of a Fire-Colored Beetle (Dendroides canadensis), was also found under the loose bark of a dead sugar maple log. Like the wasp above, it is also ready to spend the cold winter months hiding out. The carpenter ants below (Camponotus pennsylvanicus) were also found under the bark of a dead tree, this time it was an Eastern Hemlock log. Carpenter ant species that live in temperate climates are able to overwinter by entering into a state of slowed metabolism called “diapause”. 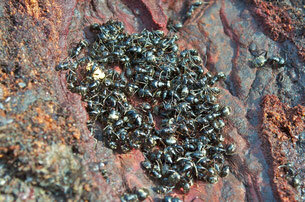 The worker ants begin to aggregate and develop large fat bodies, as well as producing glycerol. Glycerol is an alcohol that helps prevent the formation of ice crystals within the ants’ bodies. 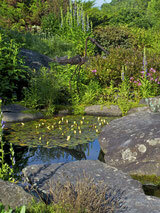 They remain in this state of dormancy until the warmer temperatures of spring arrive.